FILE - Wearing their traditional warrior helmets and jewelry, Tao aboriginal elders arrive at a traditional fishing boat launching ceremony in a village on Orchid Island, Taiwan. A top Taiwanese official says the chances of passage for a bill on indigenous people’s autonomy are slim to none. A draft law that would give land or special rights to 16 aboriginal groups will die by year’s end for lack of legislative approval after more than a decade of revisions. Taiwan’s government has tried for 14 years to craft a bill that would offer Austronesian aboriginals their own land and a budget for self-rule. The group, comprising two percent of the population, would get more space to govern themselves and pursue traditional activities such as hunting that are otherwise banned. But the top government official for indigenous affairs said the law, currently in its fifth revision, lacks majority support in Taiwan’s parliament. With a change of president looming in May next year, it’s unlikely to be rewritten. That official, Council of Indigenous Peoples Minister Mayaw Dongi, said a major sticking point is handing over big tracts of land to a relatively small population. Mayaw added that that some indigenous people have the idea that autonomy for aborigines means a reservation system like that in Canada or the United States and that the 16 indigenous groups on Taiwan’s land should carve out autonomous areas. Mayaw said that would mean placing 500,000 people on 45 percent of Taiwan’s land, which of course leads to disputes. Taiwan is a largely developed island of just 36,000 square kilometers, and Han Chinese people control most of it. Mayaw said local governments also dispute proposals that they should pay administrative costs for infrastructure and administrative services to autonomous regions. Aborigines who advocated autonomy also asked that Taiwan not curb traditional practices such as hunting, and that demand also met opposition. 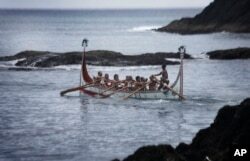 FILE - Aboriginal men of the Tao tribe take a newly launched fishing boat on a maiden voyage during a fishing boat launching ceremony on Orchid Island, Taiwan. Aborigines reached Taiwan as long as 6,000 years before the majority Han Chinese arrived. When Chiang Kai-shek moved his Nationalist forces from China to Taiwan in the 1940s after losing the Chinese civil war, his government forced the assimilation of indigenous people. Efforts to mainstream aborigines diluted their languages and cultural practices. In the 1980s officials began to make concessions. Aboriginal youth got tuition breaks, money was offered to restore cultural practices and language preservation work is in progress. Aborigines may also elect their own local officials and decide how to spend public money. Indigenous people elsewhere, including New Zealand and he Philippines, see Taiwan as a model. Kolas Yotaka, a former producer with Taiwan Indigenous Television, said a lack of autonomy will put a cap on those rights. She thinks the lack of autonomy for aborigines hurts all of Taiwanese society. She said the main damage is that they do not have democracy, and Taiwan needs a fair and equal chance to allow the existence of a society with multiple cultures. The bill’s failure will damage a lot of aborigines’ rights, Yotaka said, including land rights, rights to self-rule and natural resource rights. The government minister said the bill may go back to parliament but he expects little headway. He worries that legislators have seen enough of it already and that it is increasingly difficult to introduce a radically different bill on the same topic.